I’m a third generation iceboater and a second generation dirtboater. My Grandpa Bud lived on Lake Delevan Wisconsin in the 50’s. He my Grandma Jane and my Dad Bill sailed E scows in the summer. In the winter they had 3 iceboats they sailed. My Grandpa’s was a Skeeter, my Dad had a DN and they had a 2 seater for giving rides. In the 70’s my Dad was a boat builder in Newport Beach California area. At one point he got a job working for Lighthouse Landsailers that manufactured a landsailer called a Chubasco. Every other weekend for years the whole family would camp out at El Mirage drylake near Adelanto California to go landsailing. I was around seven years old when I picked up the sport. After a while the family grew up and the landsailing came to an end. During the mid 80’s I got the itch again for landsailing. 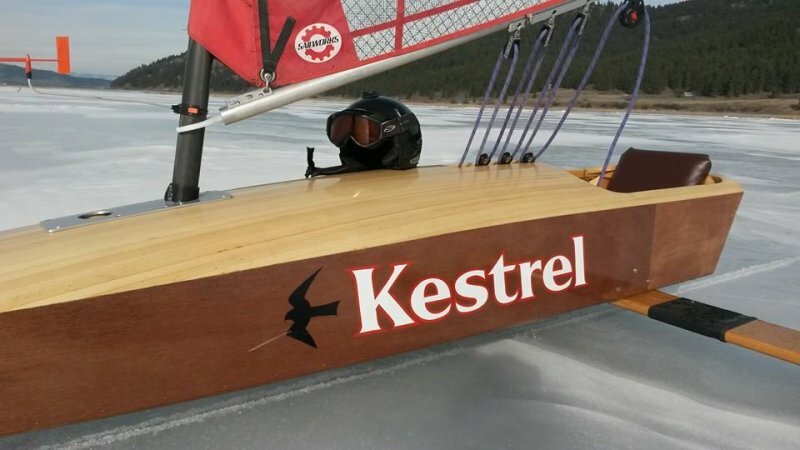 I built my first boat out of plywood and made it more similar to an iceboat than a dirtboat. 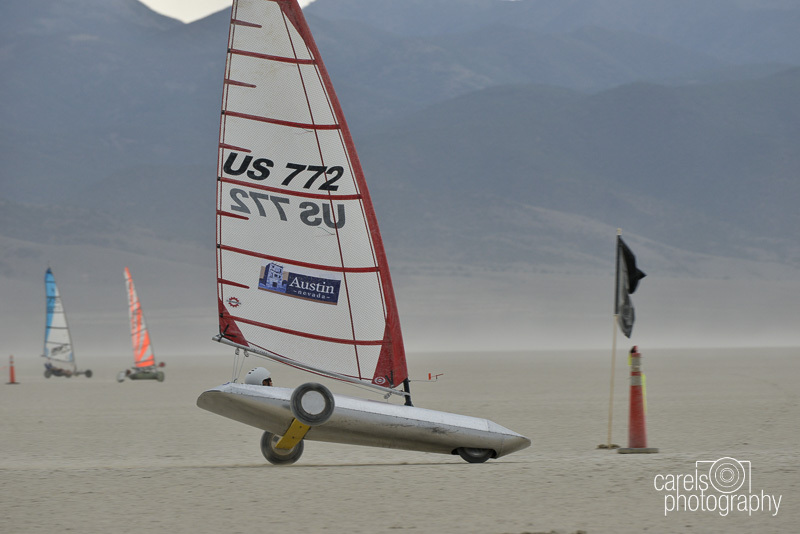 After a few years of racing and modifications I ended up winning my class at the Annual America’s Landsailing Cup held every spring at Ivanpah Dry Lake at Stateline near Las Vegas. In 1995 I had a young family of my own and had enough of California. 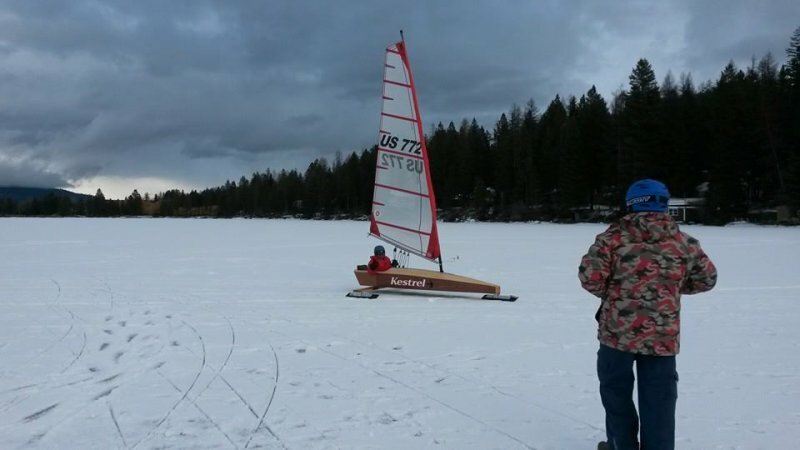 We moved to Montana where I converted my dirtboat to an iceboat with ice runners. It’s a fun sport but difficult to get the proper ice and wind to do it. Since I began Dirt and iceboating I’ve built about 20 different unique boats. I never stopped dirtboating and racing. One or two times a year I would make the trek down to Nevada or SE Oregon deserts to dirtboat. About 2011 a new international class came around called the the International 5.6 Mini. It had three rules leaving a lot of room for creativity. I found in my homemade wind tunnel testing the importance of reducing aerodynamic drag on the bigger boats I made. I carried that knowledge to the mini class. Up to that point most of the other minis were tubular framed with no fairings. I made an enclosed fuselage that encapsulated the front wheel and my self. The mini had a traveler in it to depower and a winch to trim the sail inside the fuselage out of the wind. I completed it in December 2013. I also made it to have ice runners on it so I could train with it for the up coming World Landsailing Championships in Austin Nevada July 2014. That iceboat season I sailed 13 days and put hundreds of miles on the new mini. I really got it dialed in. I ended up winning the America’s landsailing Cup and the World Championship in 2014 in the new International 5.6 Mini. It occurred to me that small iceboats allow for much more iceboating to be done. I would be lucky to get three good weekends in with my big iceboats. Most of the local places are too small for a big boat. The Mini only needs about a half mile plate of ice. I could transport it in my little truck and set it up in no time. As the next iceboating season started I felt I could improve on a new mini for iceboating. 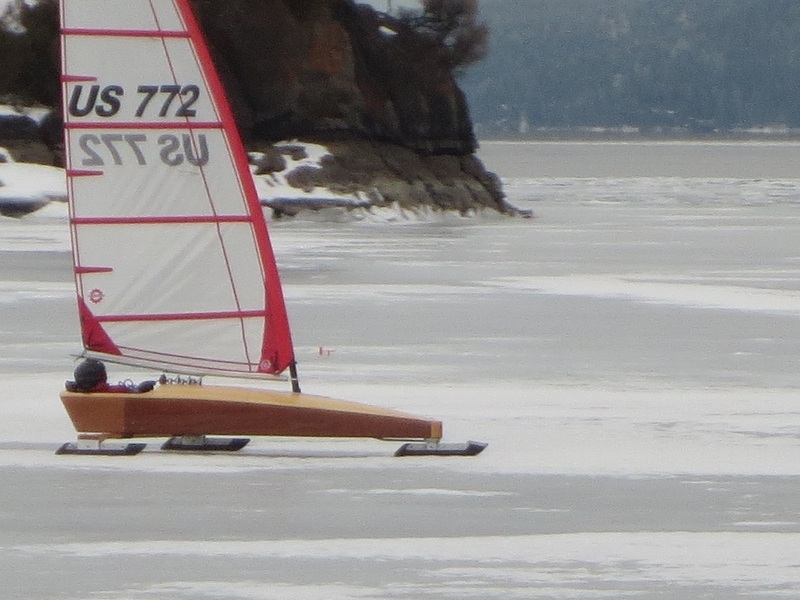 I went to a tradition wood iceboat look. The boat is about 10′long (6″ shorter than the International 5.6 Mini) and has a much longer runner base and is 10″ wider than the previous mini. I ended up with a much more stable platform with the same rig as the 5.6 Mini. It's made out of Okume plywood and the deck is strip planked with solid spruce. It weighs 157lbs all up and uses a 5.5 sm and a 4 sm sails. I get the mast and sails from Bruce Peterson at Sailworks.com. The mast is carbon fiber wind surfer mast with an aluminum stiffener at the base. The rig is a simple unstayed rig. I use 30″ plate runners like the DN iceboat. I made all the hardware on the boat including the runner chocks out of aluminum. There are only 2 welded items on the mast socket other than that everything aluminum bolts together. I used West System through out and wrapped the fuselage in 4oz cloth. In the mean time I let Tom Schock of WD Schock Sailboats and his family sail the Mini Skeeter. He is a neighbor of mine. Needless to say we have at least 3 or 4 Mini Skeeters to sail up here in the Big Sky next season. Next season should be better than ever!